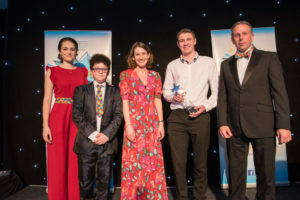 The outstanding achievements of 16 extraordinary young people from across Bath and North East Somerset were celebrated at the inaugural Our Young Stars Awards. 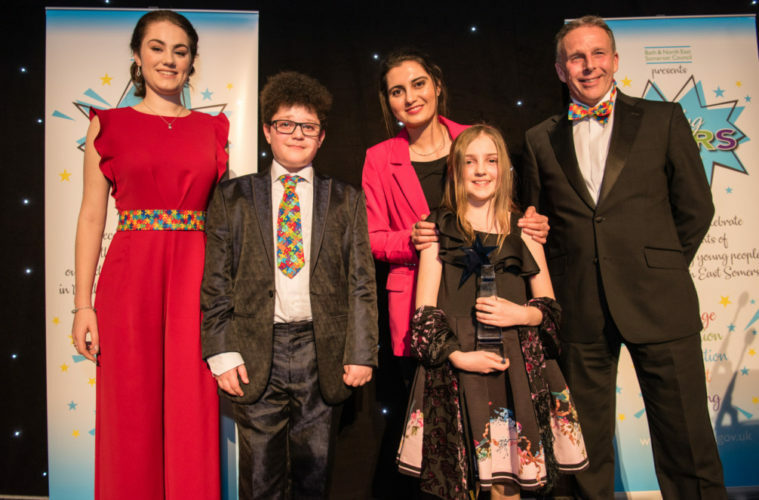 All the winners were treated as celebrities for the night with a red carpet laid out for them as they arrived at the Our Young Stars Gala Awards Dinner held at the Apex Hotel in Bath on Saturday 9 March. More than 300 guests, including the winner’s parents, guardians, friends and nominators, were moved by the inspirational stories revealed at the ceremony; from the courage of six-year-year old Bobby Lee Warman who, despite enduring a series of heart operations and living with hearing difficulties and the pain of arthritis, pursues his love of sport by taking part in rugby and gymnastics and raises money for charity, to 14-year-old Hermione Tubbs who cares for her grandmother and younger brother while studying for her GCSEs. 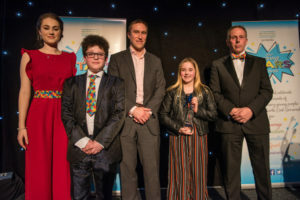 The event was hosted by Bath & North East Somerset Council Leader Tim Warren together with 12-year-old Nicholas Nikiforou, a recipient of the Diana Legacy Holder Award for his work campaigning against bullying and 17-year-old Jasmin Miller, who is member of Bath and North East Somerset’s Youth Parliament. 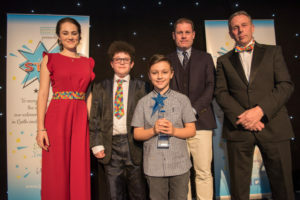 More than 70 young people were nominated for the Our Young Stars Awards. 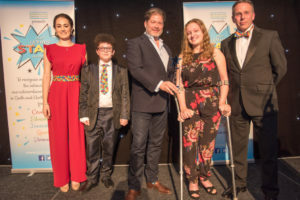 Summer Carey-Daw, aged 14, was born with Cerebral Palsy and has undergone extensive surgery during her life. Last year she had an operation that involved breaking both her legs and straightening them which meant she had to learn to walk again. Despite having significant time away from Ralph Allen school she has achieved well in her studies. She offers support and encouragement to other children with disabilities and has become a friend and mentor to a young child in her school who also has Cerebral Palsy. Kieran Cunningham, aged 17, has given countless hours volunteering with Nova Sports and Coaching, where he acts as an assistant coach helping children and adults with learning and physical disabilities take part in physical activity. Over the past eight months he has helped to engage up to 600 people in sport. Kieran struggles with reading and writing, but has recently applied to The Princes Trust for funding to be trained as a professional rugby coach. Hannah Wienburg, aged 11, took part in the national Fiver Challenge which helps children understand how the economy works. She developed a clear business plan to produce and sell macaroons. She costed her product, predicted the uptake and delivery and turned her £5 investment into £80. Hannah made the short list of the national finals of the Fiver Challenge for the most inspirational individual. Evie Wilkinson, aged 12, is profoundly deaf and uses a cochlear implant and a digital hearing aid to hear. She was extremely nervous about starting school swimming lessons as she needed to remove her hearing equipment. However, with support from her parents and teachers she learnt swimming specific sign language. She became an excellent swimmer, captaining her school swimming team and she now regularly competes for Norton Radstock Swim Club. Finley Brennan, aged ten, has faced a series of difficult events in his young life. In 2015 his mother was seriously injured in a road accident, a few months later his baby sister was born and then became very poorly and underwent major surgery. Alongside this, another family member became gravely ill and the family suffered a sudden bereavement. Putting his own emotions and needs to one side, Finley showed great concern for his mother and sister, and Finley gave them crucial support and comfort both emotionally and physically. His endearing, sensitive and caring nature shone through at the most trying of times. Jasmin Miller, aged 17, has had a challenging childhood and has been living with foster carers since the age of ten. However, she is using her experience to help other young people in similar situations. 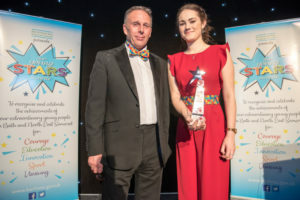 She is a Member of the Youth Parliament for Bath and North East Somerset, giving a voice to young people across the authority and regionally. She has campaigned for issues impacting on young people including mental health, racism, transport and votes@16.